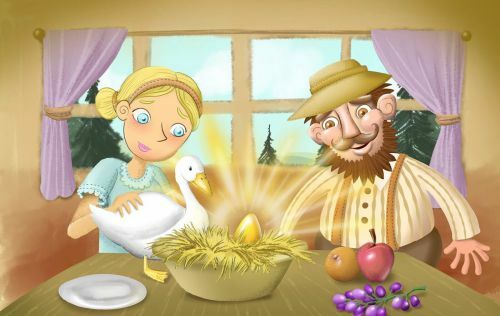 This is one most amazing short stories for kids, The Golden Goose. Once upon a time in a village, there lived a farmer with his wife. They were very poor. They had nothing but a little farm where they grew vegetables that they could eat. However, he managed to save a little money each time he sold vegetables from his farm. Eventually he saved up enough money to buy a goose. He took it home and made a nest for it to lay eggs. “The goose will produce eggs which he could use for selling, eating and making bread”, thought the farmer. Also, read The Ant And The Grasshopper. The next morning when he went to gather some eggs for his breakfast, he lifted the goose and to his surprise the goose had laid a golden egg. The next morning, he found another egg and the next, and the next. Slowly and steadily, the farmer and his wife were becoming richer and richer. Also, read The Honest Woodcutter. “Just think if we could have all the golden eggs that are inside the goose, we could be richer much faster,” said the greedy wife. “You are right! We would not have to wait for the goose to lay her egg every day,” replied the farmer greedily. The next day, farmer went to the goose quietly and picked her up carefully. He was hiding the knife in his pocket. The couple killed the goose and cut her open only to find that she was just like every other goose. She had no golden eggs inside of her at all, and they had no more golden eggs. Alas! Now the farmer and his wife had lost the goose and they would never get and golden egg ever again. You may also like to read, The Ugly Duckling. MORAL: TOO MUCH GREED ALWAYS LEADS TO GREAT LOSS.